We are China Emergency Rechargeable LED Hazard Light Manufacturers Suppliers Factory, offering Green Red Yellow Blue Amber Orange White Black Emergency Rechargeable LED Hazard Lights. This magnetic supreme led hazard light emits 360°ultra-bright light from an array of 16 LEDs, visible for up to1.2 miles (2Km) away. Itis waterproof and crushproof. You can run it over with a tank. Unlike flashlightswith alkaline batteries or chemical light sticks, Safety light units can handleextreme temperatures and extreme situations (intrinsically safe), and featurean impressive 2 years storage/shelf life, using lithium batteries that won'tever leak. This same technology used by first responders and the military isnow available for you and your family. This safety light is ideal for breakdown& emergency roadside situations. It has 9 different flash patterns and is withthe following features. Easy to carry: Due to compact size it is easy to carry in a saddle bag, tank bag, or even those small under seat storage spaces that mostbikes have. Charging:The indicator light aside led hazard light turns RED and make a Green/Red alternating flash. Fully Charged: The indicator light aside led hazard light stops flash and keep steady. If indicator light turns red, not flashing, it means led hazard light is placed incorrectly and can not be charged. Magnetic Supreme Led Hazard Light is Must-Have device for car driver! Magnetic Supreme Led Hazard Light is a great device to make you and your car seen and safe. 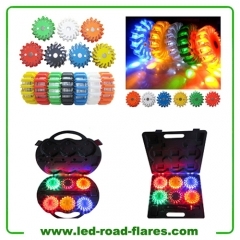 If your car breaks down at night, in the fog or rain day,Magnetic Rechargeable Led Road Flares will make your car seen to prevent traffic accident at night or on a rainy or foggy day. It is an essential piece of equipment for police, firefighters, EMTs, rescue services, first responders, members of emergency response teams and the general public.